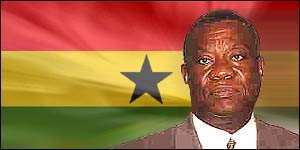 Accra, Dec. 7, GNA - Professor John Evans Atta Mills, Presidential Candidate of National Democratic Congress (NDC) in Election 2004, on Tuesday said he was satisfied with the voting process and was confident that he would win the election. "The question of what I will do in the event I lost does not arise at all because I can tell from my tour of the country that I and the NDC have such phenomenal support that there is no way I would lose," he said. Prof. Mills made the statement in an interview with Journalists after he had voted at the Regimanuel Phase One Polling Station in the Ledzokuku Constituency. He was the 309th person to vote at exactly 1017 hours and his wife, Naadu was the 310th person to vote out of the 707 registered voters expected to cast their votes at that station. Prof. Mills, who resides in the Regimanuel Gray Estates, off the Spintex Road, arrived at the polling station in a convoy of three Land Cruisers at exactly 1015 hours, wearing a white shirt and a pair of ash trousers. He came with an entourage including leading members of the NDC, including Mr Kwamena Ahwoi, Mr Joshua Alabi, Dr Kwesi Botchwey, Commodore Steve Obimpeh and Mr Elvis Afriyie Ankrah. After thumb printing, Prof. Mills kissed the ballot paper a number of times before putting it into the ballot box. Prof. Mills said he had no doubt that he would win the election hands down with more than 50 per cent of the votes. "I do not envisage a run-off at all because I am winning hands down." Asked how he felt about the various pre-electoral survey reports, all of which went in the favour of the incumbent, President John Agyekum Kufuor, he said, "the authenticity of the actual electoral results will tell whether those survey reports are anything to go by". Prof. Mills noted that the calm at the polling station where he voted was what he expected to prevail at every polling station across the country saying, "we need such peace and tranquillity to develop this nation". He said he had been informed that there was a problem in the Fanteakwa Constituency in the Eastern Region, where Mr Samuel Ofosu Ampofo was the NDC Parliamentary Candidate. Prof. Mills said it was the choice of voters to decide whether to stay at polling stations and observe the process or not. "But we have spoken to our rank and file to stay outside the 50 metres distance the EC has designated and to behave themselves." Commodore Obimpeh, Dr Botchwey and Mr Emmanuel Botwe of Regimanuel Gray Estates, were some of the prominent people, who also voted that the same polling station. Miss Lydia Osekre, Returning Officer at the Polling station, told the GNA that as at 0705 hours all electoral materials had been brought to the station and the voting started at exactly 0720 hours. Parliamentary candidates competing in the constituency are Nii Nortey Dua, NDC; Dr Gladys Norley Ashitey, New Patriotic Party (NPP); Ebenezer Nii Otu, People's National Convention (PNC), Sampson Nii Ashitey Trebi, Convention People's Party (CPP) and Emmanuel Nii Ashie Moore, Independent Candidate. Polling agents of only the NDC, NPP and the Independent Candidate were present at the station.